NuSTAR was launched on June 13, 2012 from the south pacific atoll of Kwajalein on a Pegasus rocket. New observations from NASA’s Nuclear Spectroscopic Telescope Array, or NuSTAR, are filling in the missing pieces in the puzzle of how massive stars explode. 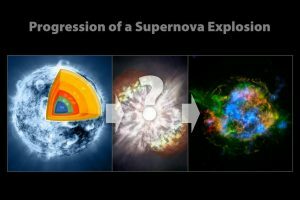 The illustrations above show the progression of a supernova blast. A massive star (left), which has created elements as heavy as iron in its interior, blows up in a tremendous explosion (middle), scattering its outer layers in a structure called a supernova remnant (right). The supernova explosion itself also creates many elements, including those heavier than iron, such as gold. In addition new data from NuSTAR suggests that exploding stars slosh around before detonating and this Caltech simulation shows how scientist are rethinking pre launch models of what happens when a star explode.